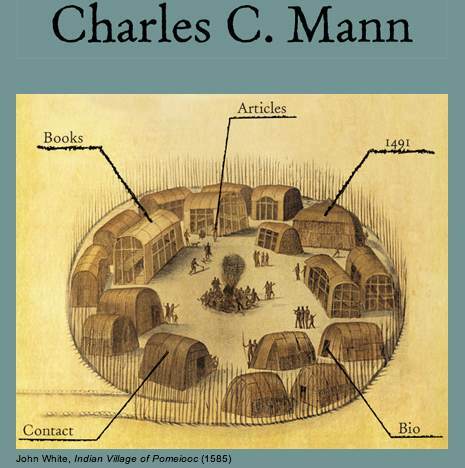 Charles C. Mann, Come To Kerala! Below us was the Beni, a Bolivian province about the size of Illinois and Indiana put together, and nearly as flat. For almost half the year rain and snowmelt from the mountains to the south and west cover the land with an irregular, slowly moving skin of water that eventually ends up in the province’s northern rivers, which are sub-subtributaries of the Amazon. The rest of the year the water dries up and the bright-green vastness turns into something that resembles a desert. This peculiar, remote, watery plain was what had drawn the researchers’ attention, and not just because it was one of the few places on earth inhabited by people who might never have seen Westerners with cameras. Dappled across the grasslands below was an archipelago of forest islands, many of them startlingly round and hundreds of acres across. Each island rose ten or thirty or sixty feet above the floodplain, allowing trees to grow that would otherwise never survive the water. The forests were linked by raised berms, as straight as a rifle shot and up to three miles long. It is Erickson’s belief that this entire landscape—30,000 square miles of forest mounds surrounded by raised fields and linked by causeways—was constructed by a complex, populous society more than 2,000 years ago. Balée, newer to the Beni, leaned toward this view but was not yet ready to commit himself.